In many ways, measuring performance is simple. You are either getting it done or you’re not. If you’re a salesperson, you are either putting up the numbers or you are not. But that measurement can be misleading and unclear. It doesn’t tell you why and how the numbers are appearing (or not). You need to figure out why and how certain factors lead to success or failure, as opposed to focusing on whether or not you’re successful (the what). Focus on the why and how and forget about the what. 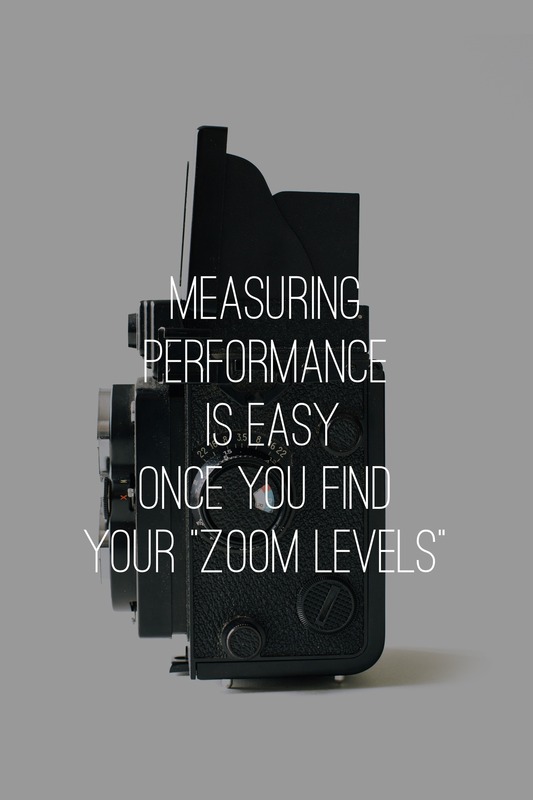 Measuring performance should start with your “zoom level”. Like a zoom lens on a good camera, think about measuring yourself and your people as a series of zoom levels. Determine what’s most important at each level to create an accurate picture of performance. Zoom into a week’s activities. What do you see? On a daily basis, where do you spend your time? For example, a sales manager could ask him or herself questions like this: How many daily calls are you making? How many prospects have you talked to? How many thank-you notes have you written? How many testimonial stories have you captured? What are the most important daily and weekly activities you can be executing in order to fill the various stages of your sales pipeline? And the number of meetings with prospects I have each week. These five metrics can tell you whether or not that trade show “program” paid off. How are you measuring your business? Most companies now have a dashboard, but I find that they are much too complex to be useful. Having access to tons of data is like having seven bottles of booze in your cabinet. Yes, you have it, but you don’t try to drink it all at once. Pick your 3-5 most important metrics and measure those. For a B2C business, perhaps these are unique views, view-to-registers, register-to-subscribes, attrition and average revenue per user. For a B2B company, the measures might be number of proposals, closes, average contribution margin, attrition, and client delight. Here’s the key: zoom out to only those few things that are really important to your business. If you zoom out to all of the data you can capture, there will be no coherent story there and you won’t have an accurate picture of what success or failure looks like. Once you’ve established your zoom levels and the focus of each, now you are prepared to have much more efficient performance conversations that move beyond the what and get to the why and how of success or failure. Management is the critical link to a powerful team and a team is made up of powerful performers. Focusing on each zoom level will allow you determine how and why your people are successful.